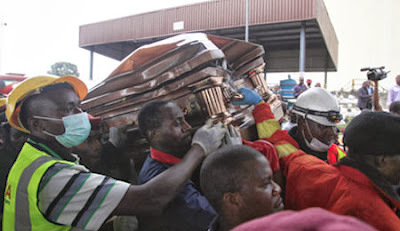 The coffin of the late Ondo state ex-governor was found near intact, his son is one of the survivors rescued, while his wife, Agagu's brother, Femi, and others arrived Akure earlier in a separate flight. Authorities say they have to get in touch with the families first before making manifest public, as plane was chatered. While the plane was about to leave the Lagos airport, Ondo State government officials, including Governor Olusegun Mimiko, as well as other members of Agagu's family gathered at the Akure airport waiting for the corpse of the former governor. 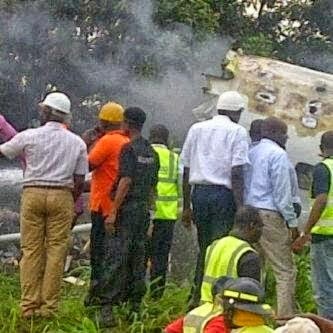 They have moved to the Ondo government house after hearing of the tragedy. I just heard that Agagu's Wife, Son, Chief Olu Falae's 1st Son - Deji Falae and Agagu's corpse all perished in the Associated Airline crash. I really can't tell how authentic this gist is, I'm still trying to get details but if this this true, it's really really disastrous. Poor souls. Recall that Agagu died in his Ibadan residence on the 13th of September 2013 after he returned from the US. He was aged 65.